We may also suggest a chapter from Carlos Taibo’s Rethinking Anarchism, a reflection by Giorgio Agamben on the State and representative democracy, and the recent series of essays on the the 15th of May movement, Reflections around an anniversary: 15M spain and beyond, as well as the series of articles on the french movement, Nuit Debout. Cold winter night. The smells of smoke and pepper spray are mixing in the air. From behind our backs, we hear the roaring of thousands and thousands of throats: “They [the politicians] are all finished! We will carry them all out!” In front of us, a burning fence, lines of riot police, and—in the foggy distance—the ultimate symbol of democracy, a parliamentary building. On our faces the cold breeze, beside us the shoulders of our comrades, and in our veins—electricity. Several months into the uprising, streets are still ours. What started as a protest against a few “bad seeds” of democracy has opened up a massive opportunity to think beyond the existent. For a brief moment, we have gained control over our lives, we allow ourselves to dream the impossible, we experiment with creating spaces of togetherness beyond hierarchies. In every second in which we discover our weakness, we also dare to regain our strength. If only we knew then that it would not be (just) state violence, the natural cycle of the movement, or the court dates, but (mostly) democracy, that would drag us back into reality. 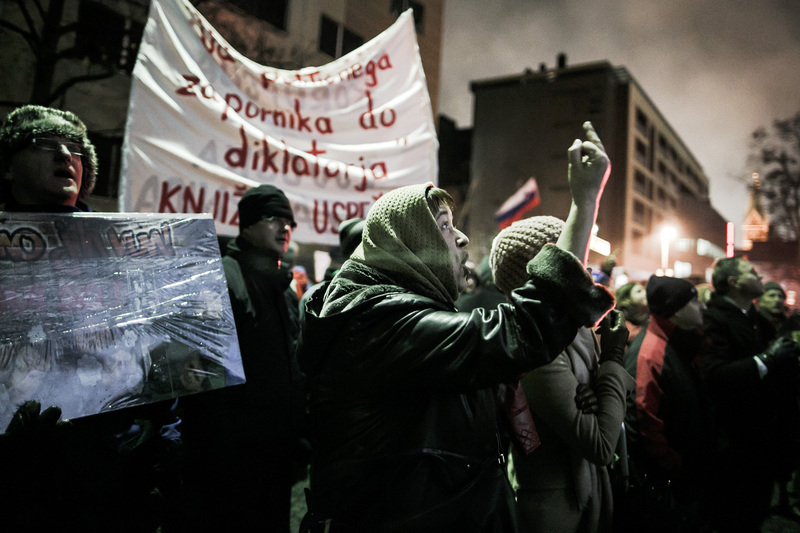 In winter 2012–13, a massive wave of protests swept Slovenia, a small country in the northern Balkans. It started in the second largest city, Maribor, a de-industrialized husk that was once the center of Slovenia’s vanished automobile industry. The corrupt mayor had installed speed-checking radar at every major crossroads, resulting in hundreds of already impoverished people being charged with penalties they could not afford to pay, for the profit of a private company. In a series of clandestine attacks and public demonstrations, people burned the speed-checking devices one by one, then gathered on the squares and streets to inform the mayor by means of Molotov cocktails, rocks, and everything else they could get hold of that he was no longer welcome in their town. In response to the initial police repression, solidarity protests spread around the country in a matter of a few days. They lasted for six months. On one hand, these protests were a reaction to the disastrous effects of the transition from socialism to free market capitalism, which left many people poor and humiliated. On the other hand, from the beginning, they were clearly aimed against those who held institutional political power. This was the biggest self-organized struggle in Slovenia since the breakup of Yugoslavia in 1991. It brought down the mayor of Maribor and the national government—but more importantly, it opened up a space in which it became possible to invent new forms of autonomous action and to question representative democracy. Although the effects of this period cannot be reduced to the fact of defeat, it is interesting to note how rapidly much of the radical energy was channeled back into the existing order, and the central role that the language of democracy played in this. The fall of the government and the promise of a new election was the first nail in the coffin of the struggle, as it satisfied a lot of people who then began to withdraw from the streets. Meanwhile, a new political party on the left did its best to monopolize the articulation of the uprising; eventually, it emerged as a shining star in the new political order by promising more direct democracy in the parliament—the same parliament that had been the object of so much rage and disillusionment only weeks earlier. Finally, in Maribor, where the rebellion started, the next mayor who was elected came from the ranks of the uprising, from a civil society group. He promised to revitalize democracy in Maribor and carry out economic development, but the people who elected him were swiftly disappointed. By 2015, he was being investigated for corruption, with the City Council calling for his resignation. So has direct democracy contributed to the continued radicalization of Slovenian society? As intense as the experience of the uprising was, it was just one stage in a long line of struggles in Slovenia that continue to this day—from the squatting movement in the early 1990s and 2000s, through the anti-war and anti-NATO campaigns, to student occupations, self-organized wildcat strikes, anti-fascist struggles, and most recently, the opening of Fortress Europe to migration along the Balkan route. Throughout all of these struggles, many anarchists and other radicals believed that spreading directly democratic methods was one of the key elements that we could contribute to radicalize movements and keep them at odds with representative democracy, hierarchical structures, and reformist politics. It took years to realize that investing our energy in making assemblies the organizational crux of those movements might have been a step away from what we wanted to achieve. Today, some of us are beginning to think about how we might redefine this tool, shifting from the concept of direct democracy towards another framework. This is not intended as a rejection of the assembly as an organizational model. The assemblies often helped to bring people onto the streets and into the struggle; they were an important tool for organizing. However, the ultimate results were often disappointing. It was easy to blame the way assemblies were organized and our lack of energy for participating in them on the hostile forces preventing the movement from spreading throughout the society. But after mastering the game of consensus, facilitation, and all the accompanying hand signals, maybe it’s finally time to question the concept of direct democracy itself. Maybe we could understand those assemblies as opportunities for some other kind of togetherness—not as a space of rule and government, but as sites in which to disperse power into our communities. We have no universal truths to offer. These are simply the reflections of a few people on a few years of struggle. Here is what we think we have learned so far. In 2011, new, localized movements of occupation were seizing the squares all across the world. In Spain, people came out to the streets in the movement later known as 15M; in the US, it was known as Occupy. In Slovenia, as in many other parts of Europe, the first occupation started out as a protest against financial capitalism on October 15, 2011. Consequently, in Ljubljana, the movement came to be known as 15O. The occupation of the square in front of the stock exchange lasted for six months. This occupation brought out into the open all the divisions in society that are otherwise hidden. Poverty, drug addiction, homelessness, mental health problems, the misery of everyday life under capitalism—all of these became visible to everyone, so they could not be ignored as a matter of personal failure any longer. Unlike in some other places, where the central question of the Occupy movement was a demand for real democracy, 15O was not centered (merely) on that; rather, it attacked financialization, capitalism, precarity, austerity, total institutions, and representational politics. No topic was too small to discuss; for many, the camp and the assemblies became a platform to discuss if not organize for every political activity in the city. Particularly in the first weeks of the occupation, the camping was just one of many playful direct actions taking place all around the city. The assembly was the center of the occupied camp. In response to the burden of being talked at about what ought to be done, a problem that correlated with a lack of responsibility, participants in the movement developed the concept of “democracy of direct action” (DDA). DDA basically meant that whoever proposed something should also participate in it. In that sense, DDA also contributed to an increase in autonomous action rather than focusing on democratic decision-making processes within the assembly. As a result, the culture that developed in the movement was oriented towards action, mostly in the form of efforts to communicate with the general public through various kinds of performance. DDA had disadvantages as well. As often happens in a variety of structures, it (unreflectively) favored those who were articulate enough to attract more people to their initiatives. The multiplicity of actions carried out by a relatively small number of participants in the movement also meant that energy was widely dispersed, efforts were often not interlinked, and overextended comrades often struggled with burnout. Along with the distribution of political projects among a variety of working groups, DDA helped to create several different sites of decision-making; yet it did not generate a space of encounter in which people came together for mutual learning to create a meaningful force beyond direct democracy. The daily assemblies became focused on camp issues, and there were fewer and fewer participants, while the monthly assemblies focused more on the political content of the movement. Those who were involved in the working groups but not sleeping in the camp eventually felt alienated by it. In the end, 15O ended in exhaustion and frustration. Many were driven into isolation and depression. However, 15O taught us several important lessons. First, despite all the talk about direct democracy as a positive aspect of the Occupy movements, some participants in 15O realized very soon—from practical experience—that the concentration of legitimacy in a single site of decision-making was not productive. Does it make sense to understand what was happening in the occupation in front of the stock exchange as a directly democratic movement, when all the groundbreaking and exciting things developed outside of consensus-based directly democratic procedures? Perhaps if we had set out to make the question of decentralized action central to our thinking, we could have circumvented all the problems that resulted from focusing on the assembly as the central space for coming together. If we hadn’t informally institutionalized the practice of assemblies, perhaps people would have been more capable of identifying the moment when the movement had the potential to make a big impact, and, later, identifying that it had been successfully marginalized. Perhaps we would have been more capable of asking ourselves which tactics were advancing our radical agendas, and which were contributing to self-neutralization because we were maintaining them when we should have already shifted to another approach. Ljubljana, November 2011. On one side of town, tents have occupied the square in front of the stock exchange for a month and a half. On the other side of town, students are packed into one of the biggest lecture rooms in the Faculty of Arts. The assembly has only one item on the agenda: whether to occupy the faculty to prevent the privatization of higher education. Some of us arrived ready to block the production of knowledge in the entire building, in hopes that such a radical act would open up the space and shake up the power relations in the university. We thought it would be better for the movement to be evicted after three days, still ready to keep fighting, than to exhaust itself in a limited occupation that did not disrupt the status quo of the university, let alone society at large. Others assumed that it would be enough to occupy a few classrooms and open negotiations with the authorities. After hours of discussion, a few professors and student leaders persuaded the majority of people to vote against a full blockade. For those of us who were left in the minority—whether or not we wanted to vote in first place—the choice was tough. We thought about whether to go against the decision of the assembly and occupy the entire building on our own, at the risk of alienating ourselves from the others. In the end, we went along with the decision of the assembly. Looking back, we should probably have acted differently. The partial occupation lasted for a few months. At first, the university administration was still trying to negotiate, not knowing how far the protests might go. But they soon realized they did not need to comply with any of the demands. The occupiers even gave up some of the classrooms themselves, feeling that they were not capable of filling them with their own self-organized study projects. Instead of the end of the occupation opening a wider conflict in society or drawing more people into the struggle, it left the student movement exhausted and scattered, limited to negotiating with the school authorities through the existing system of representation. There has not been any occupation in any university in Slovenia since. And anarchists? We tried to participate in a self-organized study process, but mostly it felt like we were talking to ourselves. It took months of frustration to realize that in accepting the norms of democratic decision-making, we had failed to push the moment further, missing the chance to open up productive conflicts—within the movement, inside the university, and in society as a whole. At the least, we could have started a much-needed discussion about which tactics the movement should be using, and how to decide which tactics were legitimate. But instead of setting our own agenda, we had accepted others’ priorities and lost ourselves in the process. The problem was not the assembly itself, but rather that this body was understood as the only place of decision-making, so no action outside of it seemed legitimate—even to us. Building Institutions or Opening Up Spaces? “By organizing assemblies, we wish to open new spaces of articulation of common power, that will be growing as we exchange experiences, knowledge, and opinions in order to build a common space of equality, freedom, and solidarity.” -invitation to the first “Open Uprising Assembly” in Ljubljana, late December 2012. A few months after the end of 15O, the uprising started. But no one hurried to convene assemblies. The first few weeks of activity in Ljubljana saw a variety of decentralized actions, protests, discussions, and meetings. When it became clear that certain organized groups within the uprising were trying to determine and represent the movement’s demands in order to steer the movement in a centralized and predictable direction, other participants introduced assemblies as a tool to prevent centralization and unification, rather than as a method for being “directly democratic.” By gathering many different participants into one place, the assembly created an infrastructure in which every attempt to establish hierarchies would be visible to everyone and therefore questioned and rejected. From the beginning, the “Uprising Open Assembly” was positioned as only one of several different ways of coordinating, communicating, and building common power by exchanging experience and knowledge. The aim was to create a space of convergence and encounter, but never to let it become the sole place for making decisions for the uprising as a whole. This was a space for people who wanted to do similar things to find each other, and to discuss problematic occurrences—for instance, it was the platform in which people attacked nationalism. One of the biggest achievements of those assemblies was that they served to communicate radical approaches to people who were not yet using them. The value of a diversity of tactics gained recognition in the assemblies; as a result of the discussions, many participants committed themselves to solidarity with all forms of protest. During the first few protests, some people had actively turned over demonstrators dressed in black to the police; towards the end of the uprising, when a few protesters were arrested, hundreds of people ran to the police station and blocked it until they were released. Although the uprising maintained its intensity for half a year, only a few assemblies took place in Ljubljana during that period. Based on our negative experiences from the two preceding movements, we felt that if the idea was for the assembly to be a tool for the movement rather than an end in itself, it was important to know when to drop it. When fewer people were showing up on the streets, it became obvious that we needed to move on, not to try to recreate a situation that had already passed. At the point when the assemblies could have become just a space of nostalgic behavior, we refused to call for another; instead, we started thinking about where a new point of conflict might emerge, and how to organize around it. Maribor had a different experience. Neighborhood assemblies covering roughly half of the city are still happening there today, in 2016, more than three years after the end of uprising. They mostly focus on self-organizing daily life in different city neighborhoods. Some speculate that the assemblies continued in Maribor but not in Ljubljana because there was a greater need for practical self-organization in a city laid waste by de-industrialization. Others have argued that the assemblies have continued in Maribor because one of the groups there made it a priority to maintain them as their primary project. The open question here is whether such assemblies can produce radical content—or is it enough that they are using a supposedly radical form? What if the people participating in the neighborhood assemblies use them to pursue reactionary goals? Does it make sense to promote radical values along with the tactic of assembly? Is it enough to open up space? In the uprising, despite going against and beyond the concepts of direct democracy in our practices, we were still using that term to describe many of our actions. This became a problem—not so much in the assemblies themselves, but in connection with other outcomes of the uprising. While it seemed that anarchists and anti-authoritarian ideas were at the forefront of the diverse actions on the ground, the representation of the uprising to the public fell to people who later formed a political party along the lines of Syriza, promising more direct democracy in the parliament and a productive relationship with social movements. Would they have been able to pull this off if we had not helped promote the language of direct democracy? When the uprising was dying, people wondered how to transmit the connections we’d built in the streets into our everyday lives. In one of the assemblies in Ljubljana, people formed a working group to organize in the neighborhoods, hoping to radicalize people there by setting up a structure in which people could self-organize. We never wanted to be the professional organizers of the resistance, so we only organized in the neighborhoods where we lived; likewise, we intended to rotate roles as much as possible. During the peak of the uprising, when the frequency of actions was so overwhelming that it was hard to keep track of them all, it had been easy enough to utilize the assembly as a tool without it becoming an end in itself. This became much harder when there was no one on the streets and the assemblies were the only form of action in the neighborhoods. Despite good turnouts at the neighborhood assemblies, we soon realized that people were relying on us to organize and facilitate the meetings. All of the working groups wanted us to be involved, to such an extent that we felt that it was no longer a self-organized process. We realized that it was better not to have assemblies at all than to have them organized by a few. We didn’t want to accept a position of authority in this way. For the city government, however, this was not an obstacle. When we heard that a neighborhood where we were not organizing had also started to hold assemblies, at first we thought that we were finally seeing authentic self-organization. Unfortunately, it turned out to be an intervention orchestrated by the city government through an NGO. They were financing people to work on the project of “self-organization.” The city government had coopted the framework of direct democracy, using it as a tool to neutralize any potential for dissent that might emerge from that neighborhood. When the state is sponsoring direct democracy, we have to ask ourselves how we could prevent this kind of cooptation. Is it a good idea to make movements depend on a tool that is so easily turned against them? What if the problem is not that our assemblies need to be improved, but that there is nothing inherent in direct democracy that differentiates it from the state? When people began to succeed in overthrowing monarchies, the state persisted through the introduction of representative democracy. All its institutions and functions remain intact, with the sole difference that now they are administered by elected representatives rather than hereditary sovereigns. Could direct democracy be a new version of this compromise, once again preserving the uneven distribution of power while giving us the illusion of self-determination? And in this situation, where we still need to create spaces of encounter, opportunities to engage in open discussion and realize our full potential through our intersections with one another—will the assembly continue to play a part in this process? Probably. But we may have to approach it differently, not understanding it as a tool of direct democracy but rather as a platform for connecting and coordinating autonomous actions and groups. The most recent example of this as of mid–2016 is the Anti-Racist Front, a space for individuals and groups active in migrant struggles. This is our conclusion coming out of several years of experimentation with direct democracy in Slovenia: we are tentatively retaining the forms, but we need to ditch the discourse. This entry was posted in Commentary and tagged anarchism, autonomy, democracy, revolution, slovenia. Bookmark the permalink. 1 Response to The anarchist critique of democracy (6): CrimethInc. Thanks for posting these here! Technically, this essay was not by pfm, a pseudonym for (at least one?) CrimethInc. operative in the US, but rather by anonymous participants in Slovenia. It was just posted by pfm.